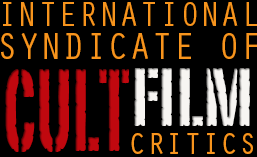 We’re in another post-apocalyptic situation, readers: in the few years that the ISCFC has been going, we’ve seen every variety, from all over the world (although mostly Italy and the USA, admittedly) with all sorts of reasons and cures. So it’s nice when one shows up which manages to do something a little original with both the ideas and look, and it’s even nicer when one of those movies that was a feature in every video shop (but for some reason I never rented) turns out to be kind of decent. This also might be in the conversation for “most obscure movie with two Oscar winners in it”. F Murray Abraham (“Amadeus”) shows up near the end, and Ben Kingsley (“Gandhi”) has a brief appearance too. But the main cast is almost as interesting with, as you’ve no doubt seen already with the poster above, Mark Hamill in a rare non-Star Wars leading role. But the problem is, he’s not really the leading man – he’s front and centre at the beginning, then becomes a supporting player, then disappears for half an hour, then shows up again near the end. The real hefty leading work is done by the great Bill Paxton and the unsung Bob Peck (“Edge Of Darkness”, one of the best TV series ever). They didn’t have quite the same good fortune with their casting of women, with Kitty Aldridge and Susan Leong going on to have decent if unspectacular careers in TV. It’s the classic template for British movies of the time – have an American lead, maybe an American support, to sell it overseas, and pack the rest of the cast with British character actors. Something called “the Convergence” has messed up the world, and the Slipstream is the super-strong wind that dominates life. Because fuel is tough to get hold of and wind is plentiful, we’ve taken to the skies, and the most common form of transport are little glider-planes (with lots of discussion of balloons and other light aircraft too). Tasker (Hamill) and Belitski ( Aldridge) are cops in an area which sees very few cops; and they’re tracking down Byron (Peck), who’s wanted for murder. The beautiful Irish landscape is flown and trudged across and Byron is captured; but when they stop at a diner, they run into Owens (Paxton), a chancer who sees the opportunity to make some money and steals Byron for the bounty that’s on his head. And from then on, the plot just sort of gently meanders through the post-apocalypse, as Owen and Byron meet all sorts of different people and we get to find out all the ways that humanity can survive. Robbie Coltrane pops up as the boss of an odd little group, and fans of “Aliens” will notice Ricco Ross as “1st man at table”. And there’s lots and lots of shots of people flying. While it’s got that flavour of “Blade Runner” or “Midnight Run” at times, it would be difficult to make a movie with this plot and not have echoes of those two classics. There are some interesting ideas, though, such as the group near the end who’ve hidden themselves away from the world inside what looks like a museum, and their moral code; plus, there’s a religion which has sprung up and it feels real and lived-in. Someone clearly spent a decent amount of money on this, or got some amazing access to some unique places. Or both. While there aren’t many big action set pieces, the scene where Owens has to rescue Byron from the kite he’s been tied to is tense and really well done. “Slipstream” is not a beloved film, particularly (20% on Rotten Tomatoes), and the longer it goes on the more it becomes apparent why that might be. The biggest problem is there’s no real reason why Tasker is such a monster. He tracks his guy down and he’s ready to make some money, sure, and in his first interaction with Owens he seems a little inflexible when it comes to the law. But after you see him slaughter an innocent group of people, and go all the way to “the dark side” in the space of minutes, you’re wishing he’d have some reason to behave that way. The twist is cleverly done, though, but right at the very end one or two characters suddenly behave in weird ways and we’re supposed to just be fine with it, I suppose. And the wind, while central to the plot, does leave a few too many scenes with a bit too much dust, so you’re squinting and trying to figure out what’s going on. I think this and “Hardware”, a British sci-fi film from around the same time, are both interesting but probably a little bit too flawed to be able to really get behind. It was director Stephen Lisberger’s last movie, but he’s hopefully still making bank off “Tron”, which he also directed; and writer Tony Kayden got his start on “The Waltons”, and just seeing that name written down reminds me of boring rainy Sunday lunchtimes. As the movie was wrapping up, my friends and I mentioned that this would be a fine candidate to be remade, with plenty of ideas in it and a lot of potential, just let down by the execution. Then, of course, we realised that only successful movies get remade, no matter whether they’re good or bad, and “interesting failures” are almost always left that way. It’s a shame, especially when you’ve got stuff like “Cabin Fever” getting remade a mere 14 years after its original release. Cut down on the scenes of stuff flying, improve on the motivation of the villain, and you’ve got a heck of a movie on your hands. Still, I’d recommend it, as it’s different enough to warrant a watch, and it’s not offensively bad in any area. Bob Peck is fantastic, the sets look great, and even though you’ll have to fill in some of the holes yourself, you’ll hopefully have a fun time doing so.